The Best Child Psychology blogs from thousands of Child Psychology blogs for parents on the web using search and social metrics Data will be refreshed once a week. Child Psychology newsletter is a comprehensive summary of the day's most important blog posts and news articles from the best Child Psychology websites on the web, and delivered to your email inbox each morning. To subscribe, simply provide us with your email address. Richmond Hill, ON About Blog Child psychologist Dr. Tali Shenfield and other experts offer advice on child development, child mental health, and intelligent parenting topics. Our mission is to deliver psychological and psycho-educational services to children, adults, and families. Facebook fans 859. Twitter followers 2,593. Rockville, MD About Blog Child psychology and medical research. From how massage can help infants cry less, to the effect of chemical pollution on children, read the latest child psychology news here. Facebook fans 1,760,194. Twitter followers 220,169. About Blog We are a group of psychologists, who specialise in working with kids, teens and young adults. Follow to keep up with Articles, ideas and help from a child/adolescent psychologist in Adelaide. Facebook fans 5,991. Twitter followers n/a. Delray Beach, FL About Blog A full service center offering a variety of clinical, therapeutic, educational and supportive services to children ages two through twenty two in warm and welcoming environment. Anxiety, stress and mood issues are very common around the world. Our goal is to help every person learn how to recognize and face their fears. Facebook fans 138. Twitter followers 14. Facebook fans 1,503. Twitter followers 19. About Blog The "Childmyths" blog is a spin-off of Jean Mercer's book "Child Development: Myths and Misunderstandings". The blog focuses on parsing mistaken beliefs that can influence people's decisions about childrearing-- for example, beliefs about day care, about punishment, about child psychotherapies, and about adoption. New York, NY About Blog Promoting children's healthy development. My blog speaks to parents, professionals who work with children, and policy makers. Through stories from my behavioral pediatrics practice (with details changed to protect privacy) I show how contemporary research in child development can be applied to support parents in their efforts to facilitate their children’s healthy emotional development. Facebook fans 7,593,667. Twitter followers 550,635. About Blog The Society of Clinical Child and Adolescent Psychology (SCCAP) and the Association of Behavioral and Cognitive Therapies (ABCT) teamed up to launch a website to promote effective, science-based therapies for children. Our mission is to provide parents and clinicians with accurate, up-to-date information on evidence-based psychosocial treatments for children and adolescents. Facebook fans 420. Twitter followers 521. About Blog We are a group of Educational Psychologists commonly known as Child Psychologists from around South Africa, with the single common goal to provide relevant and up to date information about all aspects of being a child in South Africa. Our primary focus is on the emotional well-being of children and how to ensure that children reach their full potential in all social and academic areas. About Blog The Division’s purpose is to encourage the development and advancement of clinical child and adolescent psychology through integration of its scientific and professional aspects. Our mission is to provide parents and clinicians with accurate, up-to-date information on evidence-based psychosocial treatments for children and adolescents. Facebook fans 420. Twitter followers 454. Sydney About Blog The Quirky Kid Clinic is a unique child psychology clinic for children and adolescents aged 2-18 years. We work from the child's perspective to help families find their own solutions. our mission is to provide children, families and the professionals that work with then with quality, effective, practical and evidence based services and products. Facebook fans 3,069. Twitter followers 807. Washington, DC About Blog A multi-disciplinary practice offering a broad range of services to children, adolescents, adults, and families. Our team of highly skilled psychologists bring decades of experience in understanding and treating a range of neurodevelopmental, clinical and interpersonal issues across the lifespan. Facebook fans 93. Twitter followers 206. San Antonio, Texas About Blog Clarity Child Guidance Center is a mental health treatment center for children and adolescents in South Texas. We provide crisis stabilization, psychiatric evaluations, and ongoing therapy. Facebook fans 2,516. Twitter followers 800. About Blog Ladybug House specialises in health care for kids, including speech pathology for children, psychology for children and occupational therapy for children in the northern and western suburbs of Melbourne and now on the Gold Coast in the suburb of Mudgeeraba. Facebook fans 325. Twitter followers 5. Pittsburgh About Blog Dr. John Carosso & Dr. Robert Lowenstein, Community Psychiatric Centers. Our blog shares insights & tips on raising children and teens with Autism & ADHD. Facebook fans 739. Twitter followers 14. Melbourne, Australia About Blog Child therapy provided by an experienced team in a fun therapy space. peech therapy, OT, Psychology, Music Therapy, Groups at Ormond & Moonee Ponds. At Sensational Kids we recognise the value of every person and are guided by our commitment to excellence and leadership in the area of child therapy. Our dedicated and experienced team works closely for optimal outcomes for your child. Facebook fans 1,117. Twitter followers 101. About Blog Kids & Co provides specialist psychological care for children, adolescents and their families. We have assembled a unique team of practitioners, who bring a wide range of expertise and training in the assessment and treatment of childhood emotional, behavioural and family problems. About Blog Beanstalk Child Psychology provides children with ASD the most effective evidence-based intervention available according to 30 years of research. Facebook fans 363. Twitter followers n/a. Buckinghamshire, UK About Blog Everlief psychologists can help with behaviour and emotional wellbeing both at home and at school. The first thing we do at Everlief is get to know all about you or your child. Facebook fans 736. Twitter followers 450. Facebook fans 846. Twitter followers 813. New Haven, CT About Blog Emma has worked as a Psychologist with children and adolescents for 20 years. She is passionate about delivering evidence based psychology programs and interventions that make a difference to the education, health and wellbeing of young people. LEAP's mission is to develop the strengths and talents of young leaders who implement year-round, community and school-based programming. Facebook fans 1,134. Twitter followers 1,403. Phoenix, Arizona About Blog Dr. Beth is Clinical Child Psychologist for preschoolers & primary grade children ages 3-8. These are her reflections upon children from the course of a clinical day. Her aim is to help parents, teachers, caregivers & pediatric professionals interpret child needs and respond with solutions. Facebook fans n/a. Twitter followers 2,339. Facebook fans 871. Twitter followers 1,252. Werribee About Blog Comprehensive psychology and paediatric dietetic service for all ages, with a particular focus on issues of childhood, adolescence and parenting. Blog regarding issues of child psychology, parenting, child development and education. Facebook fans 1,139. Twitter followers 70. The Hague About Blog Expat Child Psychology offers help to children who experience social and emotional struggles, developmental delays or behavior problems. Facebook fans 388. Twitter followers 288. Minneapolis, MN About Blog Dr. Terrie Rose - child psychologist, a national trainer, and leader in the field of early childhood development. I am passionate about inspiring adults to build responsive, consistent and protective relationships with children that promote healthy brain development and emotional readiness. My goal is to encourage adults to see from the baby’s point of view in an effort to promote change. Facebook fans 296. Twitter followers 229. Calgary, Alberta About Blog Serving Calgary for more than 20 years, RMPS has a reputation for high-quality, psychological services specializing in children psychology services for children, youth, and families specializing in assessment and developing individualized, targeted treatment plans. Facebook fans 19. Twitter followers 358. About Blog ‘Peaceful Kids’ Mindfulness and Positive Psychology program for schools. About Blog A show created by a doctoral student in clinical child psychology, covering helpful information from what he has learned throughout grad school. About Blog Dr. Bhooshan Shukla's (Pune, India) Blog about Child Psychology, Child Psychiatry. About Blog Tuckahoe Child Psychology offers comprehensive, psychological support that effectively addresses problems affecting children and adolescents, helping them back on a positive track. Helpful tips, strategies, and guides from Dr. Henderson on healthy child development, parenting, childhood mental health awareness, and more. 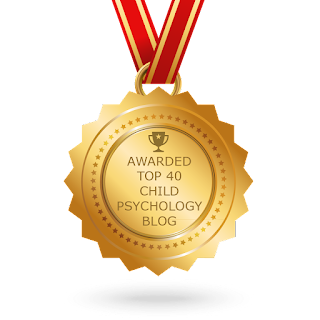 CONGRATULATIONS to every blogger that has made this Top Child Psychology Blogs list! This is the most comprehensive list of best Child Psychology Blogs on the internet and I’m honoured to have you as part of this! I personally give you a high-five and want to thank you for your contribution to this world.